Just Shutters Camberley are the undisputed experts in providing beautifully bespoke shutters to the stunning homes in this area of Surrey. Camberley boasts a wide variety of breath taking homes. whether you live in an opulent town house, or spectacular country estate, shutters make for a stunning addition to your home. Start your Just Shutters journey today by calling 01932 500270, or alternatively use the buttons above. Simon and Georgina Broadhurst run the Surrey Division of Just Shutters. The husband and wife team are passionate about interior design – thriving on providing their customers with the perfect shutters to suit their homes. 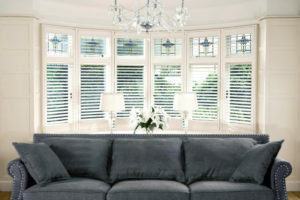 Just Shutters stocks one of the most extensive ranges available in the UK. Furthermore, we stock our own exclusive ranges and speciality lines that you won’t find anywhere else. Therefore, you can trust in your Just Shutters experts to find the right shutters for you! -Local representatives. Each Division of Just Shutters is run by a local entrepreneur. Therefore, you are receiving the highest levels of customer service of a local firm with the value of a national one. -Clean up after the installation. Your home is your castle, therefore it should be treated like one! Our fitters will ensure your home is as clean as they found it before they leave the installation. Start your Just Shutters journey today by calling the team on 01932 500270.